White paper on crime 2004 Part5/Chapter3/Section3/3. Most prisoners in Japan are sentenced to imprisonment with labor and obliged to carry out"assigned labor"under Article12of the Penal Code.Those prisoners imprisoned without labor are also permitted to engage in labor voluntarily.Such prisoners'labor is called prison work.Prison work is an element of imprisonment with labor,and it also has a positive significance as a treatment measure for reforming offenders and rehabilitating them into society.The Council on Prison Administration Reform says that it has no objection to placing prison work as one of the important treatment measures. On the other hand,the Council points out that the present contents of treatment have become rigid due to trying too much to secure eight-hour working days equally for all prisoners,and recommends that working hours should be shortened according to individual needs,to introduce other treatment measures including counseling,religious instruction,course instruction,life guidance etc.The following will examine the significance,present situations and challenges of prison work,and will describe prisons'efforts in response to the recommendation mentioned above. Prison work is a part of the penalty for those imprisoned with labor,and it also has a positive meaning as a treatment measure for reforming offenders and rehabilitating them into the society.Many prisoners do not have working habits,are too self-centered to be cooperative,or lack endurance.Through prison work,they are supposed to(1)acquire regular working habits and a disciplined lifestyle,(2)maintain their mental and physical health,(3)build adaptability to social life through teamwork with others,(4)cultivate incentive to work and vocational knowledge and skills,and(5)develop their endurance and concentration ability.Prison work occupies an important place in the prison administration of Japan. Prison work also plays a significant role in managing prisons.Through imposing prison work on prisoners,a small number of staff can maintain order and a safe environment for the treatment of inmates.Furthermore,production work and independent work for sustaining institutions alleviates the financial burden on taxpayers.These incidental and practical benefits are not the original purpose of prison work,but they cannot be disregarded. Considering such significance and functions,prison work seems to continue to be placed as an important part of the treatment of prisoners. In the light of the significance mentioned above,the major premise of prison work is to secure an adequate amount of work for all prisoners so that no prisoners are without work,and to secure appropriate contents to draw out prisoners'incentive to work and to help them to rehabilitate into society.However,the number of prisoners who have to work has increased in line with prison overcrowding,while work orders have decreased due to the economic downturn.Consequently,maintaining sufficient amount and quality of work has become a growing concern in recent years. Fig. 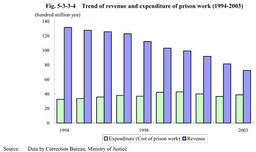 5-3-3-4 shows the revenue and expenditure of prison work over the last ten years.Expenditure or cost of prison work has shown no significant changes,while revenue has dropped sharply from13billion yen in FY1994 to7.3billion yen in FY2003.At present,prisons manage to secure prison work by accumulating small contracts with companies.It will become even more important to make further efforts to acquire people's understanding of the significance of prison work and the role of prisons,and to explore new contractors for prison work. As mentioned above,prison work has a positive significance for reforming prisoners and rehabilitating them into society,and prisons have tried to secure both quality and quantity of prison work.The Council on Prison Administration Reform recommends reviewing prison work from a different viewpoint. Although the Council registers no objection to placing prison work as one of the important treatment measures,it points out that treatment or care other than prison work,such as counseling,religious instruction,course instruction,life guidance etc.would be more effective for some prisoners.It also says that the present treatment measures have become rigid due to trying too much to secure eight-hour working days equally for all prisoners,and recommends that working hours should be shortened according to individual needs,to introduce more flexible prison work,paying adequate attention to its value under the framework of current penal law. In response to this recommendation,the Ministry of Justice tentatively launched to shorten working hours to secure time for other educational treatment in three institutions,Ichihara Prison,Nagano Prison,and Nara Juvenile Prison,in April2004. Two ways to shorten working hours are being tested:one is to shorten working time by one hour per day and the other is to substitute a whole day for educational treatment twice a month.Educational treatment programs include various subjects and programs planned depending on the characteristics of prisoners,and on the human and material resources of each prison.Treatment type guidance,group work,and counseling etc.are conducted as programs for understanding victims,improving human relationships,supporting rehabilitation into society,or self-development etc.They also provide club activities for aesthetic and cultural education,and physical training and exercise for improvement of health and strength. 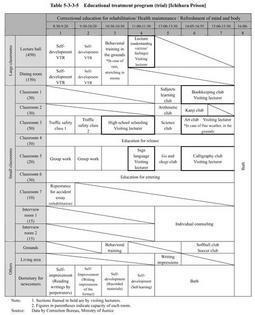 Table 5-3-3-5 shows an example of educational treatment program on an off prison-work day in Ichihara Prison,which accommodates for traffic offense prisoners. In order to better achieve the correctional goal to reform offenders and rehabilitate them into society,it is necessary to harmonize prison work with other educational treatment programs.Based on those trials,further consideration will be needed to decide concrete ways to shorten working hours,enhance and systematize educational treatment programs,and develop teaching materials etc.